Each side is equipped with an ultra precise angle sensor to check your stroke length and current position of the oar. A strain gauge on each side precisely measures the force you apply. Two independent bluetooth senders communicate with your Android device – live. 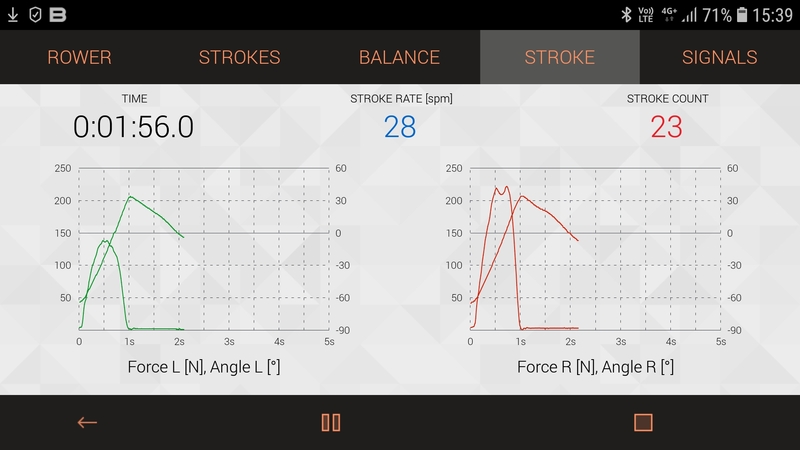 Every stroke you take results in immediate data read out – with a 99% accuracy rate. 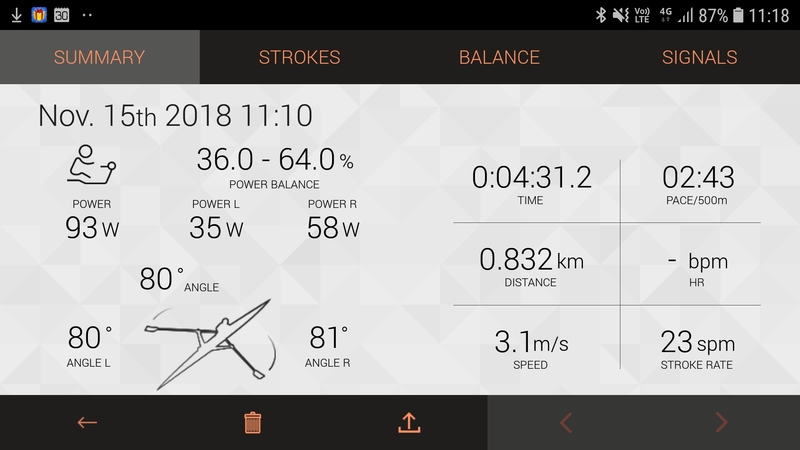 The Biorower App tells you your stroke length left and right separately, as well as your power output left and right separately. For data geeks: Force-Angle curves – the real power curves. It is obvious that the athlete who generated these curves has a left-to-right imbalance of power. For data geeks once more: force and angle curves on a time line. If you are a pro rower, this is what you need to improve your influence on the boat and synchronize it with everybody in your boat. Same influence = higher boat speed. The App is available on Google Play* We are working on an IOS App. Your personal Android device is your display. The min requirements are Android 5.0 and up as well as Bluetooth 4.0 and up. 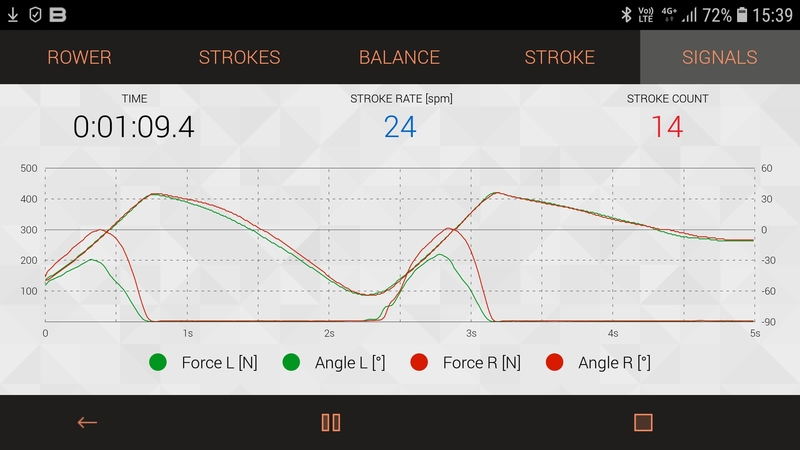 The new BIOROWER App performes a full biomechanical analysis of every rowing stroke you do. You don’t need to be a pro to use it, but you might become one. Both inboards are equipped with strain gauges, each mounted on hardened silver steel axles. Every time you take one stroke, these axles are being bent slightly, barely visible for the human eye. The precision axles guarantee an industry unrivalled 1% accuarcy of results. Additionally, both riggers are equipped with magnetic angle sensors. 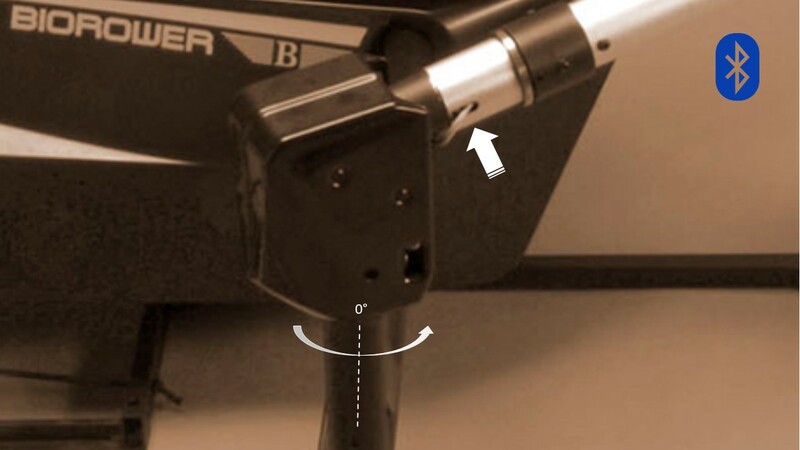 This way the system detects the actual position of your oar. 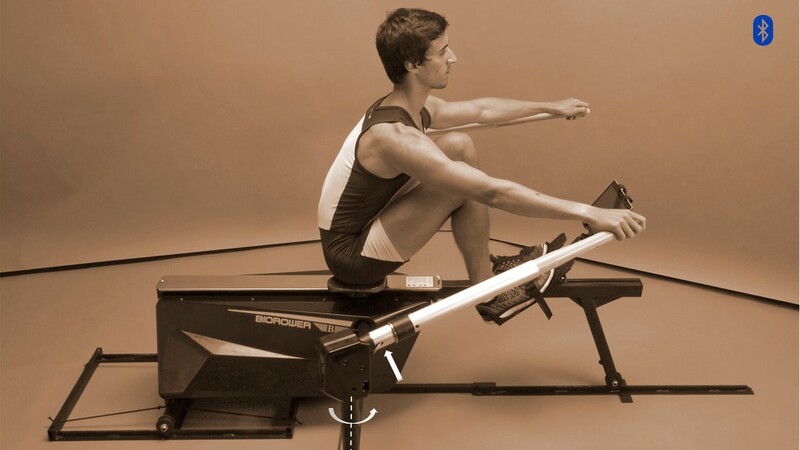 This is crucial for rowers, as you need to be informed about how much force is being applied at which point of the stroke. 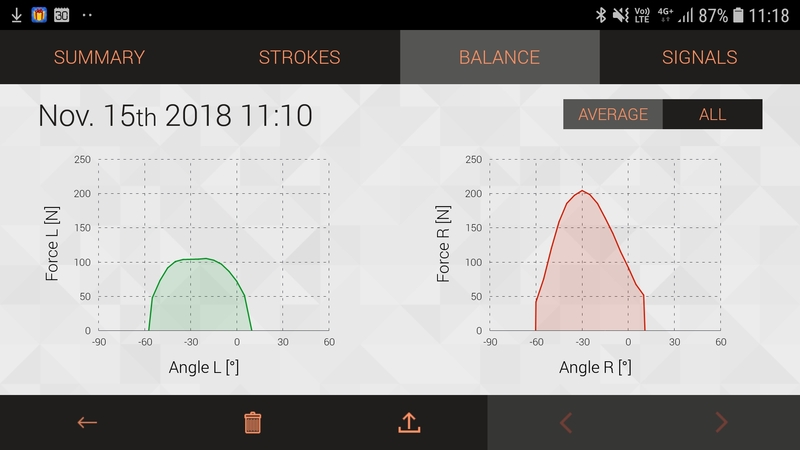 Rather than just providing a rough force curve, the Biorower provides you with handle positioning data throughout the stroke. 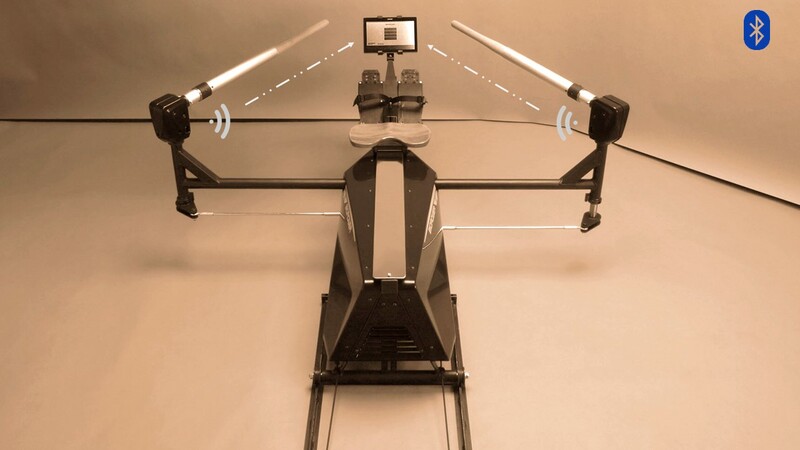 On each side, the data from each strain gauge and each angle sensor is collected by one Bluetooth sender on each oar, and transmitted to your personal Android device, which functions as a display. Left and right separated force and angle curves over a time line. For data geeks, coaches and rowing pros. 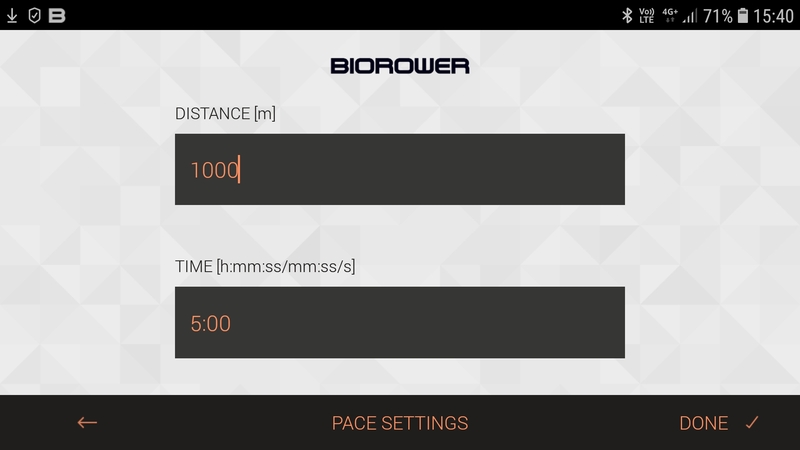 The Biorower App allows you to set paced intervalls. Select your race distance, then set the pace maker’s speed. 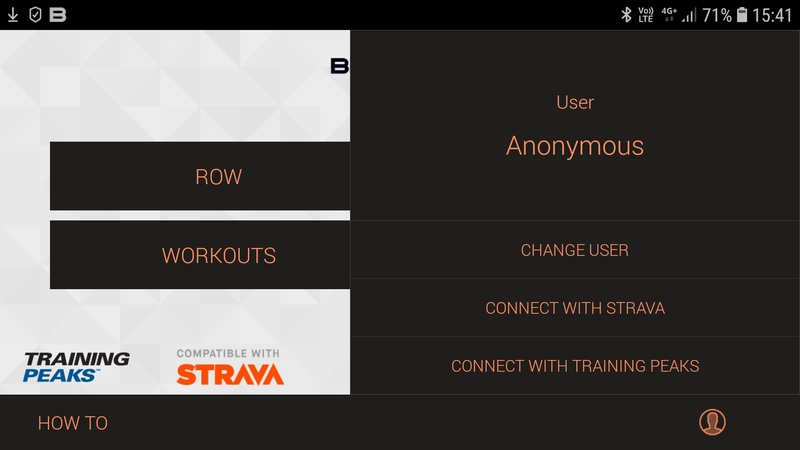 All your workouts can be uploaded to Training Peaks and Strava.